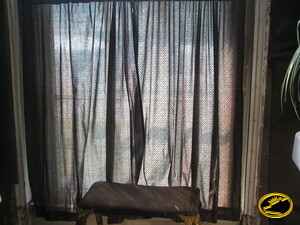 Some discarded curtains were recently donated to Bearidise for the express purpose of improving one of the bathrooms. These frightening curtains in this bathroom are reminiscent of something you'd see in a straight man's den near his duck decoy collection. They MUST GO! 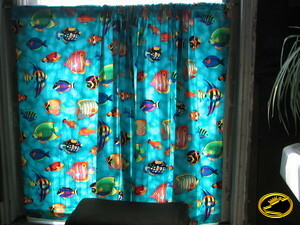 These fabulous curtains are turquoise blue. They were originally hemmed with iron-on glue. I pulled out the hems, measured, pinned, and sewed them up!